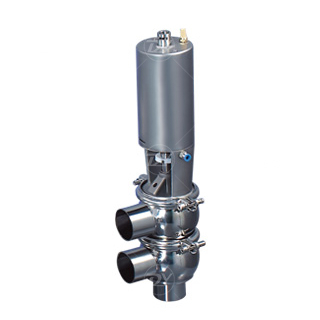 The series of valves are major let the medium reach the purpose of reversing or end stop, because the good sealing performance and cleanability, they are extensively use to different sanitary industry areas. 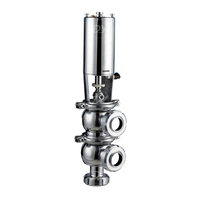 The flow diversion valves are widely used in food, beverage, dairy, bio-tech, pharmacy industries. 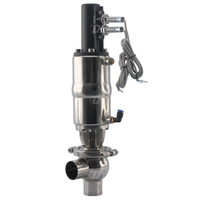 The single seat divert valve is a hygienic pneumatically operated valve used for flow diversion in the food, beverage and pharmaceutical processing industry. 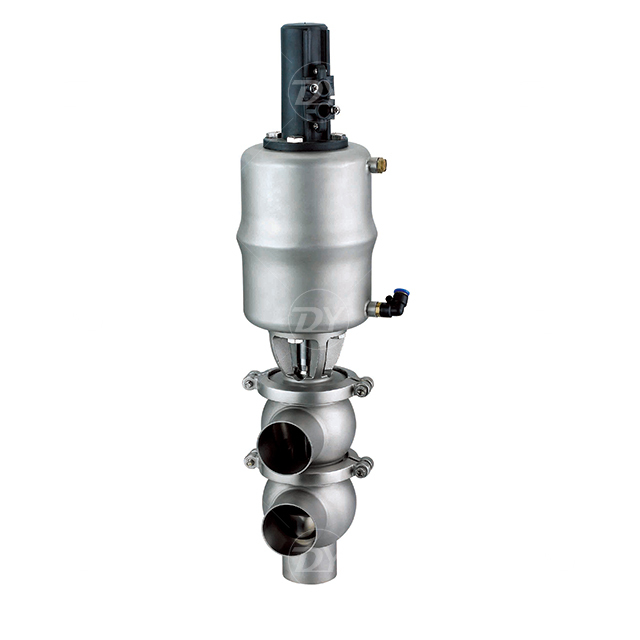 • Few moving parts, contributing to high reliability and low maintenance. • Seat gasket replacement in less than 7 minutes without removing the valve from the line and no tools required. • Max working pressure: 145 psi (10 bar). • Min. working pressure: Full vacuum. 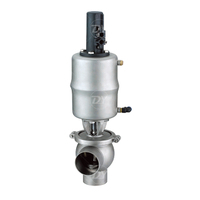 Seat valves are operated by a single-acting, double-acting pneumatic actuator or manual handle. The compressed air is applied to the actuator and the shaft is moved to place the valve in the "open" or "closed" position. 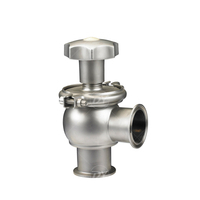 Single seat divert valves have one seal for each switching position separating the particular pipelines from one another. 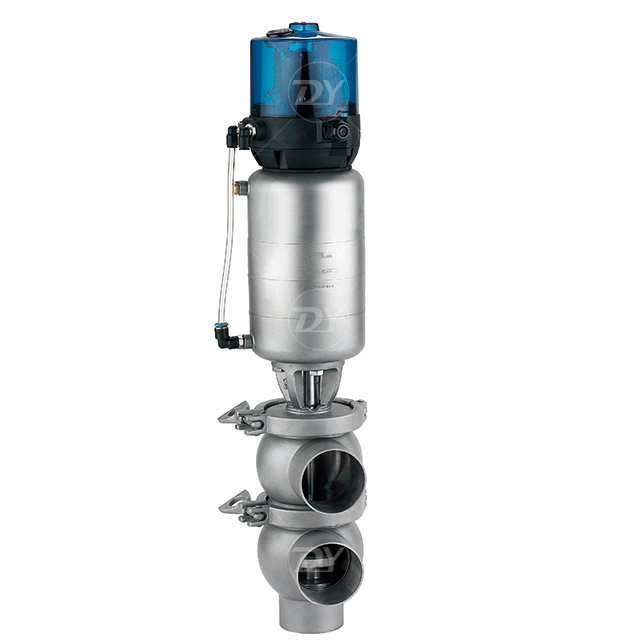 The single seat divert valves are not recommended for separating incompatible fluids. 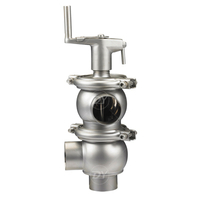 The flow coefficient Cv is the volume (in US gallons) of water at 60 °F that will flow per minute through a valve with a pressure drop of 1 psi across the valve. ∆p = Pressure drop in psi over the valve. 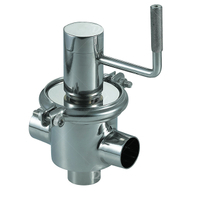 1 1/2" valve has a Cv= 35 GPM with a pressure drop of 1 psi. For a pressure drop of 2 psi which is the flow? Q= 35 X √2 = 49 GPM. Fluids other than water, please consult us.